A basic, dependable recipe. Additional seasonings may be added at the cook's discretion. Remove giblets and neck from turkey; reserve for gravy recipe. If necessary, remove any remaining quill tips from skin. Rinse turkey thoroughly, inside and out, with cold water; pat dry. Sprinkle cavity with salt if you are not going to stuff turkey. To stuff, lightly pack dressing into body cavities of turkey. Tuck legs under flap of skin around tail, or close cavity with skewers, and truss. Tie ends of legs to tail with cord. Lift wingtips up and over back, and tuck under turkey. Place turkey on a roasting rack, breast side up; brush entire bird with oil or butter. Insert meat thermometer in meaty part of thigh, making sure it does not touch bone. Bake in a preheated oven at 325°F (160°C) for 4 to 5 hours or until meat thermometer registers 185°F (approximately 85°C). When turkey is two-thirds done, cut the cord or band of skin holding the drumsticks ends to the tail; this will ensure that the thighs are cook internally. Turkey is done with drumsticks are easy to move up and down. Let stand 15 minutes before carving. Garnish as desired. For Giblet Gravy: Combine first 3 ingredients in a saucepan. Bring to a boil; cover, reduce heat, and simmer 45 minutes or until giblets are fork-tender. Drain, reserving broth. 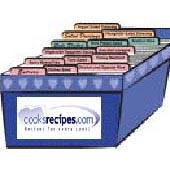 Remove meat from neck; coarsely chop neck meat and giblets; set aside. Add water to reserved broth to equal 3 cups. combine broth, chopped neck meat, giblets and next 7 ingredients. Bring to a boil; reduce heat, and simmer, uncovered, 30 to 45 minutes. Combine cornstarch and 1/4 cup water; stir into broth mixture. Bring to a boil; boil 1 minute. Serve gravy hot over turkey and dressing. Makes 2 2/3 cups. Note: Roasting time suggested in recipe is for a stuffed turkey. Unstuffed turkeys require 5 minutes less per pound.